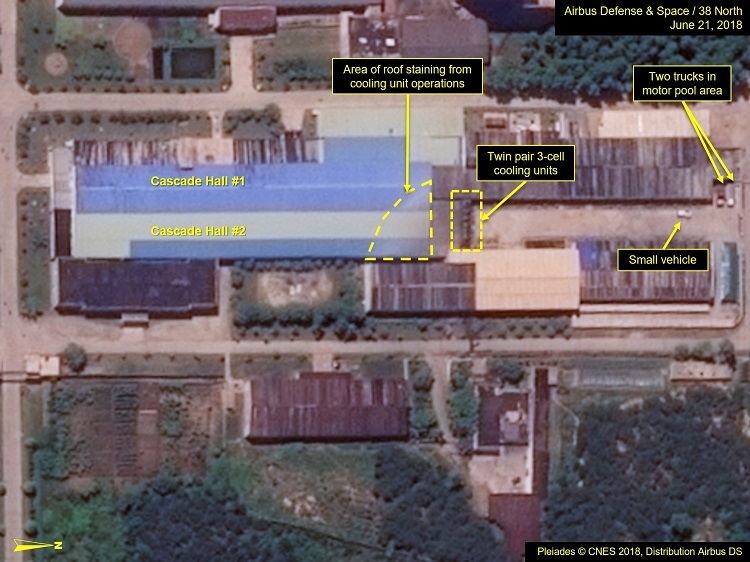 Satellite images from June 21 have shown that North Korea is rapidly upgrading its nuclear facility. It has been just two weeks since the historic Trump-Kim summit in Singapore where Kim said that he would "work toward" denuclearization. Critics have noted that the jointly signed statement was vaguely worded and included no timeline for denuclearization. To the complete surprise of others in the Trump administration, United States military, and South Korea, Trump announced at the summit that the US would immediately cease joint military exercises with South Korea, which North Korea had long disliked. Trump had claimed the denuclearization of North Korea as a personal victory and stated after the summit that the process would start quickly. "It will be a total denuclearization, which is already taking place." Satellite images that were made public by North Korea monitoring group, 38 North, show that actually, North Korea is continuing to improve the infrastructure at the Yongbyon Nuclear Scientific Research Center. James Acton, a co-director of the Nuclear Policy Program at the Carnegie Endowment for International Peace, has said that, "If they were serious about unilaterally disarming, of course they would have stopped work at Yongbyon." Jeffrey Lewis, a professor at Middlebury Institute of International Studies, added "This is still an active site producing plutonium for North Korea." The satellite photos specifically reveal modifications to the site's plutonium production reactor, as well as the construction of several new support facilities. Other locations exist in North Korea where most of the country's nuclear weapons materials and missiles are produced, however they cannot be detected by monitoring groups. The assumption is that they remain operational, according to Joel Wit, Director of 38 North. Thus far, the White House National Security Council, Director of National Intelligence and the CIA have not commented on the satellite images. There are no planned dates at this time for future meetings between the two countries to flesh out details of North Korea's denuclearization.